A forest can burn at different severities depending on the fuel load. The fuel load consists of the accumulations of easily ignited branches and forest liter in a defined space. The severity of the burn can impact the succession of the forest. Succession is the natural ecological process in the forest species structure over time. Fire can create opportunities for new species to get a foothold in the forest, but it depends on the severity of the forest fire as to which species will thrive, which species will be replaced, and how long it will take. 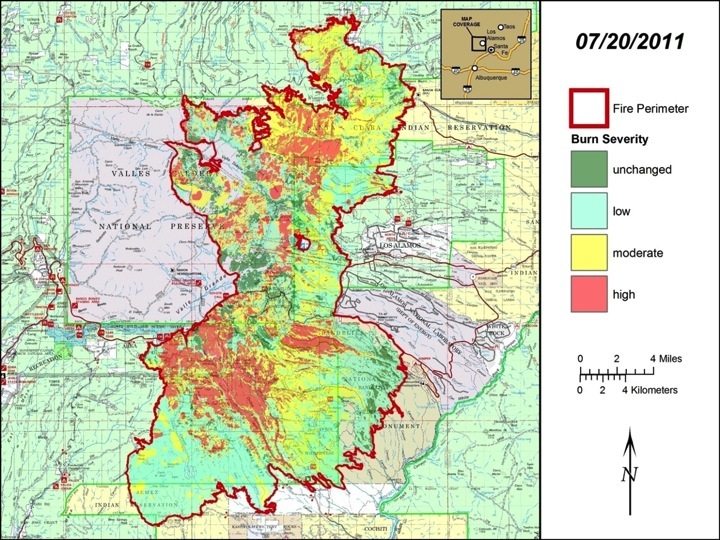 Fire is a natural process that influences the health of the forest and scientists study these processes to answer: How does the severity of burns impact the succession of forest? Learn how to use scientific data to understand the Earth's systems by interpreting the graphs. In the Labs and Activities section below, there is a student activity sheet labeled "Severity of Burns Research Graph and Questions" for students to use in interpreting the graphs. Dr. Bob Parmenter is the Preserve Scientist for the Valles Caldera Trust in northern New Mexico and is responsible for organizing and coordinating the research, inventory and monitoring programs on the Valles Caldera National Preserve. He is a member of the Valles Caldera Trust’s executive management team and the NM EPSCoR management team. Dr. Parmenter’s research interests include studies on ecosystem disturbance, climatic influences on plant and animal populations, successional processes, plant-animal interactions, predator-prey relationships of both vertebrates and invertebrates, decomposition and nutrient cycling, and the ecology of zoonotic diseases (specifically hantavirus, plague, and West Nile virus). Dr. Parmenter received his Bachelor’s degree from Colorado College in 1974, a Master’s Degree in Zoology from the University of Georgia in 1978, and his Ph.D. in Biology/Ecology from Utah State University in 1982. Correlations to the Next Generation Science Standards for the Teacher's Guide to Valles Caldera: The Science can be found here. Additional information on the Next Generation Science Standards can be found at http://www.nextgenscience.org.